NGOs acknowledge vote on first ever EDC criteria – call on European Parliament to reject flawed criteria for the sake of human health and environment protection. • The criteria require a very high burden of proof, which makes the identification of substances as EDCs very difficult and is likely to result in long delays. • The proposed exemption from identification for certain pesticides and biocides that are designed to be endocrine disrupting would strongly undermine the objective of the EU pesticides and biocides law to phase out the use of EDCs. EDC-Free Europe is a coalition of more than 70 environmental, health, women’s and consumer groups across Europe who share a concern about endocrine disrupting chemicals (EDCs) and their impact on our health and wildlife. 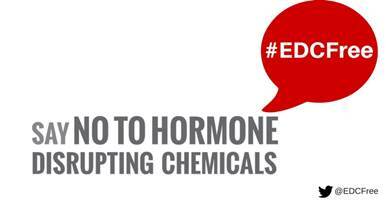 EDC-Free Europe is a coalition of more than 70 environmental, health, women’s and consumer groups across Europe who share a concern about endocrine disrupting chemicals (EDCs) and their impact on our health and wildlife.